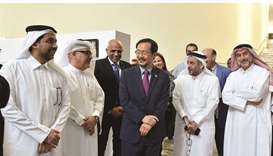 Barwa Bank has announced the names of the most recent round of draw winners for Thara’a, its Shariah-compliant savings account, at the bank’s headquarters. As the draw results showed, Issa Ali al-Ansari and Iqbal Ahmed Abdul Bari each won a cash prize of QR10,000, the bank said in a statement. 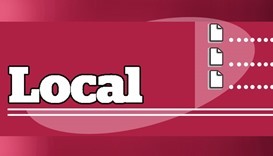 Also, a cash prize worth QR5,000 was awarded to the following bank clients: Sahar Kamel Zarandah, Mubarakah Saeed al-Marri, Hally Sanicas, Salem Saeed al-Khelaifi, Nafja Abdul Rahman al-Maadeed, Kathy Sok Theng, Amel Mohamed al-Yafei, Yusra Mohamed al-Maskri, Fatima Abdul Rahman al-Mohannadi, Ghanim Nasser al-Nuaimi, Rashid Hamad al-Adbah, Mohamed Ahmed al-Alwi, Khaled Mohamed al-Yazidi, Ahmed Samy El-Ghamry, Jory Gelaidan, Sumaya Mehdar al-Yafei, Yasin Juma Gul, Mohamed Eissa Shamiyeh, Maryam Faroogh Amani, Elafraa Mohamed and Anas Badawy. 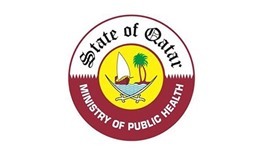 The draw was conducted under the supervision of a representative from the qualitative licence and market control department at the Ministry of Commerce and Industry. Thara’a offers account holders the chance to benefit from cash rewards up to QR1,000,000. 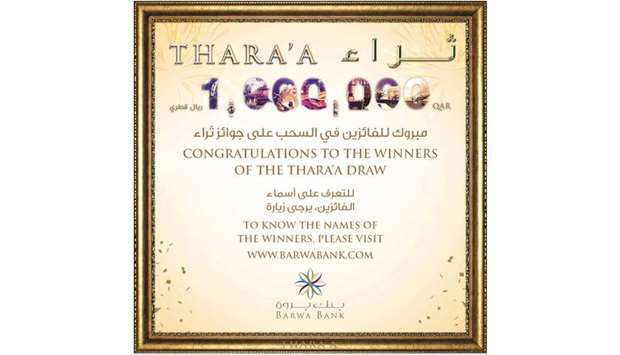 Based on several criteria, Thara’a account holders are eligible for a number of periodic draws for cash prizes. Totalling QR3,300,000, Thara’a cash rewards are distributed on both a monthly and biannual basis to customers holding a minimum balance of QR10,000. 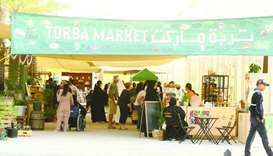 On a monthly basis, there are 21 winners per draw for the cash prize of QR5,000 each, as well as two winners per draw for the cash prize of QR10,000. Additionally, twice, a year, there are two winners per draw for the cash prize of QR25,000 each, two winners per draw for the cash prize of QR50,000 each, and yearly there are two winners of the grand prize of QR1,000,000 for each winner – rewarding 194 winners in total with cash prizes up to QR3,300,000, the statement explained. Customers may learn about the many benefits of the Thara’a savings account by visiting Barwa Bank’s website, www.barwabank.com, or by calling the Contact Centre at 800 8555.